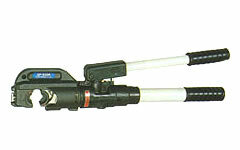 EP-510C Hydraulic Compression Tools: Izumi Products. 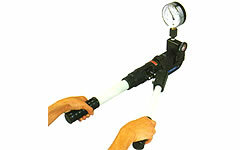 The EP-510C, hand operated compression tool features a two stage rapid advance pumping system. It accepts all U type dies currently manufactured for 12 ton tools on the market.The jaw opening of 42mm can accept larger splice upto 750KCM. Mid span sleeve connection can be installed on larger cables and the cable can then be removed through the jaw opening. Consult your connector manufacturer for exact cable, connector and die combinations. When ordering dies, specify the manufacturer's die and connector numbers. This tool will be supplied as an insulated version unless otherwise requested on ordering.